The Sydney Symphony Orchestra employs around 97 musicians on a full-time basis. Above we can see the 2015 cohort, according to the SSO’s 2015 Annual Report. In addition to chief conductor David Robertson and several concert masters, there are around two score string players, two dozen brass and woodwind players, and a percussion section. The SSO obviously also pays guest artists such as sopranos and pianists. In other words, the Sydney Symphony Orchestra is a very important provider of salaried jobs for artists. This is an economic difficulty for the orchestra, because musicians’ wages are a significant cost. But it is a wonderful outcome for the musicians employed, who have steady jobs with salaries paid every fortnight, plus superannuation, sick leave and all the other normal conditions of full-time employment. There is no comparable organisation that pays writers in this way in Australia. Why not? The answer, as so often in these discussions, is essentially that it has ever been thus. Like most artists, writers have traditionally been paid as fee-for-service contractors, providing a literary work in return for a fee. For a novel, this is an advance, around $5,000 or less in the current conditions of the Australian publishing industry. For an article online, this is a one-off fee. The going rate is around $100 to $150 an article. Unless they are journalists writing for news publications, writers are almost never formally employed under the definitions of Australian employment law. They therefore are not paid superannuation, and receive no sick leave or other entitlements. Some small streams of copyright royalties do accrue, but these are negligible for the majority. Most writers are simply ABN-holding small businesses. Exposed to ruthless market forces as small traders, they have little pricing power and small recourse to enforce payment on publishers who decide not to pay. In this, writers are no different to many other artists. In contemporary music, business models are also flexible and precarious. There are essentially no salaried jobs for musicians playing in rock bands or DJing clubs. Instead, musicians are a precariat, paid by the gig, often in cash, with no expectation of ongoing employment. The entire labour market in advanced economies appears to be heading this way. It is no coincidence that one of the synonyms for the precarious new economy of Uber and Fiverr and zero-hours contracts is the “gig economy”, a term explicitly taken from the contemporary music scene. It doesn’t have to be like this. The labour market conditions for writers (just as the conditions for doctors, politicians and CEOs) are not simply fixed by the natural law of supply and demand. They are the result of conscious decisions made by policymakers and powerful industry figures. Other models are available. As the example of the symphony orchestra shows, it is possible to imagine a cultural organisation that pays writers appropriately. Australia maintains a number of publicly-funded symphony orchestras that do pay artists. While many Australians may decry arts funding, and some artists are justifiably critical of the current distribution of that funding, I have never heard anyone complain about artists being paid appropriately, except those who decry the very notion of culture itself. It is possible to imagine an organisation that pays Australian writers in an analogous way to a symphony orchestra. With appropriate resourcing, an organisation could advertise for a series of full-time fellowships for writers at a reasonable wage. Writers could be selected by a panel of respected peers and then employed on 3-year contracts, with superannuation, sick leave and all the rest. In return, we would expect them to write. At the end of their contracts, a progress report would be submitted. You could take the analogy further. Why shouldn’t the funding organisation provide non-monetary resources, like working space, library access and perhaps even a small budget for things like travel and research? Tools of the trade could be acquired, like laptops and audio recorders for interviews. A disused space in a cheap suburb could be transformed into a hub for literary production. There is no a priori reason why such an organisation could not be created. Yes, it needs money. But Australia is a very rich country. There are philanthropists, government funding bodies and ordinary citizens who support such organisations in other artforms. Why not literature? Indeed, on current funding distributions, there is a compelling case to support something like this. Story-telling is at the heart of what makes us human. Narrative is a core aspect of nearly all forms of culture. Reading is the second-most popular form of cultural consumption in Australia, after screen entertainment. But literature receives just 2.7% of Australia Council grant funding. Symphony orchestras receive 32%. Above: Australia Council funding distribution by artform, 2015-16. The need for such an organisation is demonstrably great. Before winning the Man Booker, Richard Flanagan considered working in the mining sector. Before she won the Stella and Prime Minister’s Prizes, Charlotte Wood told me in an interview she could not make a living from her fiction. But most writers never win a prize. According to economist David Throsby, the average literary income for writers in 2007-08 was just $11,100, and the median literary income was just $3,600. Both figures were the lowest for all the artforms in Throsby’s survey. A modest beginning would see 20 writers funded for 3 year fellowships at a living wage with entitlements. I have calculated this using ABS data for the average annual full-time wage in the arts and recreation services industries. In November 2016 this figure was $42,026. Including super, this equates to a total package of $46,018 a year. It would hardly be luxury. But you might pay the rent. Paying 20 writers this amount costs around $920,000 a year, or rather less than the marketing budget of many large performing arts organisations (Opera Australia’s marketing budget was $10.7m in 2015). Even if we assume that an office must be kept and a part-time administrator and book keeper must be paid, plus some ancillary costs, it seems reasonable to assume the whole thing could be done for not much more than $1 million a year. Paying 20 writers for 3 years would come out to a bit more than $3 million. The model has the advantage of being highly scalable. As more funding becomes available, more fellowships could be offered. By way of comparison, in 2015, the federal government took $6 million over three years from the Australia Council for the purposes of setting up a new body for the literature sector in the form of a Books Council. The government changed its mind, however, pulling the funding before the Council even formed. The money disappeared from the Australia Council’s budget — just another of the many insults and injuries inflicted on the agency by the Coalition since 2013. In other words, there is certainly federal funding available, and there is a strong case for the government to return funding expressly promised to the literature sector. As argued above, there is a strong case for federal funding from the taxpayer. But this project is small, scalable and easily fundable through philanthropic means. Once up and running, it could well attract considerable support in the form of micro-philanthropy and crowd-funding. It is certainly feasible that paid subscriptions or memberships could be issued. A series of talks and workshops could also generate own-source income, although these have their own costs and should be carefully constrained so as not to overtake the primary purpose of the organisation. The obvious needs to be spelt out: this is not a for-profit business model, and should never be confused for one. The goal of the organisation should be to pay writers, not to reach some mythical state of “sustainability”. We are basically talking about setting up a small-to-medium arts organisation to pay writers living wages. There is a strong sector of such cultural organisations in Australia already, delivering impressive returns on government investment in the form of cultural production and audience reach. A lean organisation would consist of a board of eminent authors, editors and publishers, with the requisite directors enjoying business, legal and accounting experience. A fully fledged staff is probably not necessary to begin with, and the company could get by with a project officer to administer day-to-day activities, with appropriate part-time help in the form of book keeping, back office, a website and so on. Small arts organisations are incredibly lean beasts, and can be run very efficiently. As the organisation grows, it could eventually hire a skeleton staff to leverage the organisation’s reach, such as a development manager, marketer, and extra project officers as necessary. Fellowships would be advertised for nationally; there would be considerable interest. The majority of fellowships should go to mid-career and established writers, but some should be reserved for young and emerging writers. Diversity should be a key criterion, with specific targets such as gender parity and appropriate representation of minorities. There should be a mix of fiction, non-fiction, writing for the stage, and poetry. Applications should be short and the process should be simple and transparent. Successful applicants would be asked to focus on long and ambitious projects that a period of stable employment could support. This doesn’t need to be a big book: it could, for instance, take the form of a series of essays, a number of poetry collections, or the sustained pursuit of short-form criticism. Fellowships should be acquitted quite simply: in short reports penned annually, with a longer report submitted on completion. Publication outcomes, international markets reached, and prizes won would soon demonstrate impressive results for the metrically minded. To reiterate, the idea is to pay a number of writers a stable wage. Unlike the lotteries of literary prizes, grants or advances, fellowships offer stable income. Writers would be paid fortnightly for three years. They would be able to pay the rent, buy food, and to save for a mortgage or for old age. Proponents of culture tend to assume that art is a simple and unadulterated social good, and that more of it is better. You need not believe that to support this proposal. You need only ask whether a mature and diverse democracy would benefit from the ongoing employment of professional story-tellers. In a world that grows ever more complex, the need for sensitive interpretation of the interior lives of our fellow citizens has never been greater. The extrinsic benefits to Australia of fostering such understanding will be very large. The mere fact that such an organisation exists will also engender huge goodwill. The knowledge that important writers are being supported will quickly give tens of thousands of Australian readers immense pleasure and pride. But the real reason to do it is simpler even than that. Literature is a good in and of itself. The telling of stories is a fundamental human need. As I argued in my book last year, culture is central to who we are as modern Australians. Supporting it is good for our democracy and our society, because literature enriches not merely separate individuals, but the common good. It is remiss of me not to mention it here, but last month I published a book. Available now from various Australian bookstores, my first monograph is entitled When the Goal Posts Move: Patronage, power and resistance in Australian cultural policy 2013-2016. It is published by Currency House as part of their long-running Platform Papers series. The book is a short history of Australian cultural policy in the years 2013-2016, encompassing the end of the Rudd-Gillard Labor government and the first term of the Abbott-Turnbull Coalition government. This was a tumultuous period in Australian cultural policy. Significant austerity was imposed on federal arts and cultural funding. Around $400 million was cut from the budget of the ABC, and around $300 million from the budgets of federal cultural agencies like Screen Australia the Australia Council for the Arts. Most controversially, at least for the purposes of readers here, the federal government under former arts minister George Brandis, launched an audacious funding raid on the Australia Council in 2015. $105 million was subtracted from the Australia Council and given to a new cultural slush fund, revealingly entitled the National Program for Excellence in the Arts. Brandis’ funding raid was about more than just moving the budget line around: it was nothing less than an assault on the institution of the Australia Council itself, and with it a four-decade tradition of arms-length funding decided by artistic peers. The politics were just as blatant: Brandis wanted to punish what he saw as undeserving (and politically suspect) art funded by the Australia Council, and redistribute the money to a palette of works and artforms that he liked: classical Western music and opera, by and large. The pain of the Excellence raid fell squarely on the parts of Australian culture that many consider to be the most creative and innovative: the so-called “small-to-medium” sector of smaller arts companies, and the great bulk of individual artists and small collectives applying to the Australia Council’s grant programs. In a decision of remarkable cynicism, Brandis specifically ruled that the Australia Council must protect the funding of the 28 so-called “major performing arts” companies that make up the bulk of the Australia Council’s budget, thus making it inevitable that the funding cuts would fall on smaller players. The Excellence raid revealed major schisms within Australian culture. The Australia Council and its board were shown to be impotent, even supine, in the face of the calculated political assault. Major cultural institutions that many thought would defend their colleagues were conspicuously silent; Opera Australia even welcomed the decision. The Australia Council’s board, which features media celebrities and well-known former artistic directors, said nothing. The raid sparked national protests from artists and led to a Senate Inquiry, which took 2,700 submissions and issued a scathing report on the government’s actions. It also spurred a remarkable grass-roots protest movement from affected artists and small companies — one that proved surprisingly politically effective — called Free the Arts. Why was the Australia Council so vulnerable? And what is the future for Australian cultural policy? This paper explores the broader socio-political environment that allowed a conservative government to launch the most damaging attack on the integrity of the Australia Council for forty years. It argues that Australian artists and so-called “cultural leaders” have largely lost or forgotten the vocabulary of public value that might be used to defend the public policy of culture here, a development not unlike that which has occurred in other parts of the public sphere, like universities and public science agencies. The essay ends with a call to arms to rediscover the ethical and moral imperative of culture making, and the opportunity of convincing fellow citizens of that imperative. I am no anthropologist, I freely admit. In fact I am often left agog by the radical multiplicity of contemporary anthropology, such that I feel in no way qualified to write intelligently about it. Of course, this is the fate of any intelligent human who wishes to extend her reading into fields she is not intimately familiar with. So I shall write about it none-the-less. I have come to Marshall Sahlins ridiculously late, insupportably late, really, given the contribution he has made to his field, and, indeed, to the social sciences in general. It is not unreasonable to posit Sahlins as one of the genuine intellectual giants of our time, which makes it a little difficult to presuppose any meaningful assessment of his influence. There is, for instance, a lively academic debate about the validity of Sahlins’ view on kinship, which are entirely vulnerable to some quite elementary criticisms. Can it not be true that at least some role must be inherent in biology in the formation of kin relationships? Surely biology plays a role. How far can you coherently press the idea of social construction? (In Sahlins’ case: all the way). The idea that phylogenetic and other material constraints on human reproduction (defined as “biology”) do not, per se, have anything to do with human kinship systems is language designed to send us to battle stations. As Sahlins masterfully deploys it, the idiom is binary, winner take all, and it has the virtue of being utterly predictable in its analytic consequences. Since we are dealing with strong doctrinal positions, I should confess (apt word) that I also believe that human kinship is cultural. But I do not think that culture—of the discursive, internally constituted, symbol laden, and highly structured kind Sahlins has preached for decades—is enough to explain what kinship does, how it works, why it varies, or, least of all, how it develops historically and has evolved, as a discrete range of behavioral and interactive tendencies, over millions of years of primate evolution. Sahlins is of course no stranger to controversy. Indeed, he is one side of one of the more famous skirmishes of the 90s culture wars — that strange period of academic ferment that, for a time, made scholarly disputes seem relevant to the politics of their time, in a way that hasn’t been the case in subsequent decades (although perhaps we are again returning to that situation with the influence of thinkers like Piketty and Graeber). This was the so-called “Sahlins–Obeyesekere debate”, in which Sahlins squared off against a fellow anthropologist, Ganath Obeyesekere, over the historical facts and meanings around the death of Captain James Cook. The debate was sparked off by Sahlins, who in a series of books and papers (see for instance 1981’s Historical Metaphors and Mythical Realities and 1985’s Islands of History) had developed a very powerful analysis of the events leading up to and including James Cook’s death. For Sahlins, the circumstances of Cook’s death are a kind of cosmic jigsaw puzzle, in which a bizarre series of coincidences conjoin to create the exact conditions for Cook to appear to his Hawaiian hosts as first a god, and second as a fraud worthy of dismemberment. Sahlins’ thesis is remarkably well worked out, and backed up with copious evidence, including from the primary sources, both Hawaiian and English. It runs like this: Cook turned up in 1778 at the height of Hawaiian makahiki festivities — Hawaiian New Year. Makahiki is a time in which any war or hostilities are typically suspended; priests are temporarily in charge. Cook arrived, of course, in a rather impressive ship, but a particular quirk of the tall ships’ sails made them look remarkably like the Hawaiian symbol for the god, Lono. Lono was meant to turn up on that particular day of the year; Cook’s timing was almost hour-perfect. Just to make the resemblance to the myth even more convincing, Lono was meant to progress around the big island during the makahiki celebrations. Cook’s squadron also took a meandering course around the archipelago that seems to exactly mirror this progress. When Cook landed on the big island for a second time, he was taken ashore and made the central figure in a priestly ceremony, in which he was acknowledged, ceremonially at any rate, as Lono. He appears to have played along convincingly. Cook then sailed away, to all intents and purposes a Hawaiian god. But fate intervened. Cook broke a mast sailing away from the big island, and was forced to turn back and anchor for a third time. Now, everything was rather different. Makahiki was over. The king was back in charge, and Cook was no longer sticking to the script. In contrast to the celebration and deference of his previous visits, now Cook seemed like an interloper, a fellow who had pushed his luck too far. Perhaps Cook was no longer in on the joke; perhaps he was mocking his hosts? Hawaiians started to swim out to his ships and steal things, culminating in the bold theft of the Resolution‘s long boat. Cook made a fatal error in reaction. Rowing ashore with a detachment of marines, he kidnapped the ruling chief of the islands, Kalaniʻōpuʻu, and attempted to take him back to the ship. But one of Kalaniʻōpuʻu’s wives raised the alarm, and Cook and his soldiers (still holding the king) were soon surrounded by thousands of islanders on the beach. After a scuffle broke out, muskets were fired and Cook was knocked to the ground and stabbed. 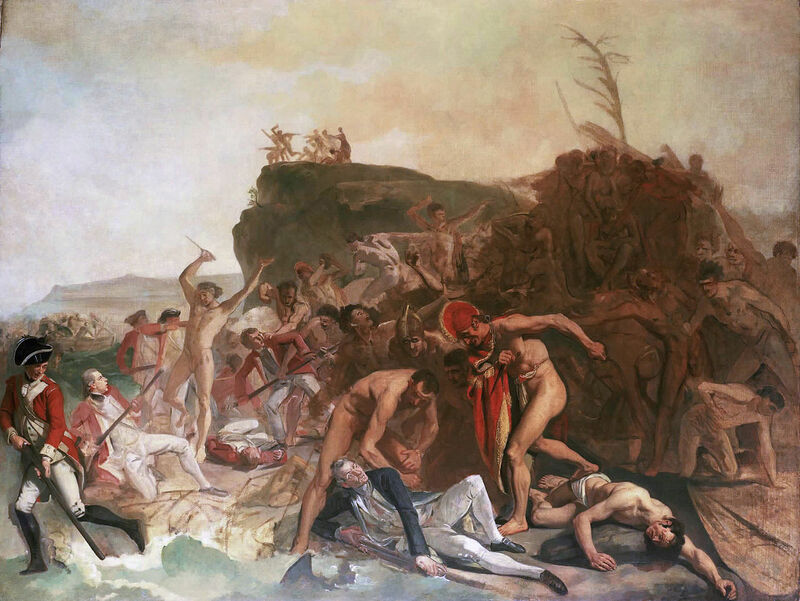 The British staged a fighting retreat, leaving Cook dead on the beach. After a number of reprisal raids, the two sides made peace. Cook’s “hindquarters” were returned to the Resolution in tribute. Space prevents me from exploring the intricacies of Sahlins’ argument in greater detail, or the considerable scholastic debate over his historical accuracy. But perhaps the most important aspect of Sahlins’ account is that it is structural. Sahlins is a symbolic structuralist, very much a follower of Boas and Levi-Strauss, and a contemporary of Geertz. (Adam Kuper gives an fine account of Sahlins’ intellectual development in Culture: The Anthropologists’ Account). Sahlins posits that Cook/Lono episode is a wonderful example of cultural structures imposing upon, perhaps even creating, historical reality. To quote Kuper, “Sahlins’ argument is, in short, that people enacted their interpretations of the past.” What we have here, in other words, at least i Sahlins’ exposition, is a convincing historical example of “mythopraxis”: of cultural determinism in its most pure form. Some were not convinced. Foremost among them was Ganath Obeyesekere, who assailed Sahlins’ acount in a biting 1992 polemic entitled The Apotheosis Of Captain Cook : European Mythmaking In The Pacific. Obeyesekere took Sahlins at his word, examining what might have been going on Hawaii in 1779, and decided that the real myth-makers here were not the Hawaiians but the British. Was Cook really considered by the islanders to be a god? Of course not, Obeyesekere argued! What had occurred was the clever manipulation of historical custom to frame the European interlopers for reasons of pure realpolitik. Cook arrived at the helm of a powerful squadron, with soldiers and trade goods that could be extremely useful to the elites engaged in Hawaiian power politics. What’s really going on here is the paleo-imperialism from Sahlins, who has fallen for the myth of the noble savage himself. Obeyesekere, a Sri Lankan, knows a thing or two about the British empire. Sahlins is simply repeating Rousseau’s old fantasy: “the Western idea of the redoubtable European who is a god to savage people.” Coming, as it did, at the height of the culture wars then engulfing the US academy in he early 1990s, Obeyesekere’s book aroused considerable interest. Sahlins was so enraged by what he saw as a gross misrepresentation of his position, that he wrote an entire book in response. Disciplinary godfathers such as Clifford Geertz wrote it up. Ian Hacking devoted a chapter of his wonderful The Social Construction of What? to the controversy. How can we adjudicate the Sahlins/Obeyesekere debate? Ultimately, as both Kuper and Hacking concede, the nitty gritty of the history must be debated by the specialists. This is difficult. The primary sources are patchy and plagued by mutual incomprehension: the British had little or no Hawaiian, the Hawaiians little English, and the Hawaiians did not even leave written sources at the time — these were in fact written a generation later by British missionaries. The priesthood that mediated the Lono ceremonies had dissolved in the years after the British arrived. So, in common with so much history, we can’t really be sure. So, while Hacking ultimately sides with Sahlins, Kuper does not. And it is to Marshall Sahlins’ view of history as itself fundamentally cultural that we will next turn. This review was first published in Overland. I’ve been reading Jürgen Osterhammel’s history of the nineteenth century, The Transformation of the World. What can you say about this breath-taking kaleidoscope of narrative (and meta-narrative) history? It’s almost as impressive and various as the century it dissects. By training, Osterhammel is a specialist in Chinese history, but he clearly knows a thing or too about the burgeoning field of ‘macro-history’. His command of the historical literature is staggering. Each chapter reads like a self-contained essay, often of startling originality, on topics such as ‘energy and industry’ and ‘imperial systems and nation-states’. His turn of thought is inquisitive but also rigorous, and his approach to various topics is by turns surprising and provocative. Beginning his chapter on economic history, for instance, Osterhammel is confident enough to approach the industrial revolution by writing, in a teasing tone, that ‘it may be appropriate to place an essay on industry and energy at the beginning of the third part of this book’ (p. 637). The chapter is a crystalline masterpiece of historical writing. ‘It is time to decenter the Industrial Revolution,’ he quips. My response: hey, why not? Osterhammel’s method is syncretic and panoramic. His chapter on cities, for instance, harks back to the classic work of Asa Briggs, while his chapter on the frontier wars that everywhere pressured and subjugated Indigenous peoples in the period is a masterpiece of historical scholarship and mordant style. While one reviewer has criticised ’a drastic mismatch between the immensity of scale and the modesty of argument’, for mine it is precisely his humility and polyglot historical philosophy that makes this such an enjoyable book. Osterhammel concludes with another surprise: a rather optimistic perspective of the century’s achievements. Ideas, resources and people became more mobile than perhaps any time in world history since the break-up of the western Roman Empire – not always for the good, certainly, but dynamic and transformative nonetheless. Despite the century’s atrocities, it was also an epoch in which liberal tenets of equality and liberation made great strides, culminating in the miraculous year of 1863 when serfdom was abolished in Russia, and slavery emancipated in the Union-controlled United States. The century produced a global capitalist system and vast empires that spanned the globe. But it also incubated new ideologies of dissident ideas: socialism and anarchism, Jacksonian democracy and liberal constitutionalism. In the case of socialism, this ideological movement created an entirely new sort of state. 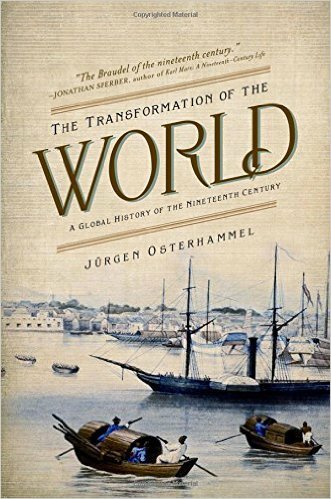 Finally, Osterhammel decides, the nineteenth century was a time of emancipation, which survived an era of rapacious colonialism and imperialism to flourish in unexpected places, particularly in Africa and Asia. Gazed at across the smoking ruins of Europe in 1918, ‘the world of yesterday’ described by Zweig seemed to have vanished forever. But the seeds of the social flora of the later twentieth century – Osterhammel names liberalism, pacifism, trade unionism and democratic socialism – had demonstrably been sown in the nineteenth. Robert A. Caro in 2013. Photograph: Michael Loccisano. In recent weeks I’ve been working my way through historian Robert A. Caro’s majestic biography of Lyndon Baines Johnson, The Years of Lyndon Johnson. Enjoying them is easy. Caro is a hugely readable narrator, is in effortless command of his sources, and has one of the most complex and dynamic politicians of the 20th century as his subject. The result is quite simply some of the most compelling history I’ve ever read. Unpicking why Caro is so interesting, though, is a lot harder. In doing so, I think we can learn a little about the practice of history, which this work avowedly is, as well as of sociology, which would seem to be further afield from Caro’s core discipline. Firstly, a little of Caro’s craft. This essay by Chris Jones from 2012 in Esquire gives you a flavour on the man’s work practices and his almost unbelievable dedication. Caro has been working on the Johnson books since 1975. His book The Power Broker on Robert Moses, the New York planner and freeway builder, has just been republished, with revisions. The essay by Chris Jones helps us understand the sort of historian Caro is: he is a kind of journalist. How, Gottlieb asked Caro, did he get that quote? Caro told the story. Moses had instructed friends and close associates not to talk to him. Shut out, Caro then drew a series of concentric circles on a piece of paper. In the center, he put Moses. The first circle was his family, the second his friends, the third his acquaintances, and so on. “As the circles grew outward,” Caro says, “there were people who’d only met him once. He wasn’t going to be able to get to them all.” Caro started with the widest circle, unearthing, among other things, the attendance rolls and employment records from Camp Madison. Now some four decades later, Caro tracked down, using mostly phone books at the New York Public Library, every now-adult child and every now-retired employee who might offer him some small detail about Robert’s relationship with his parents. One of the employees he found was the camp’s social worker, Israel Ben Scheiber, who also happened to deliver The New York Times to Bella and Emanuel Moses at their lodge each morning. Scheiber was standing there when Bella had expressed her frustration with her deadbeat son, and he remembered the moment exactly. “So that’s how,” Caro told Gottlieb. But Caro is more than simply a reporter, of course, because his books have a subject over and above the men he writes about, and that subject is power. Caro is therefore, in a very real way, a theorist of society, and in particular the power relationships within a society. A good example is the second half of Caro’s second Johnson book, Means of Ascent. In it, Johnson uses the classic compare-and-contrast structure of the seasoned essayist to explore the 1948 Texan Democratic primary race between Johnson and veteran Texan Democrat, Coke Stevenson. At that time, Texas was a lock for Democrats, so the winner would become the state’s junior senator. Caro’s biographical sketch of Stevenson and his career — he was the most successful Democrat in the state, and had earned himself the sobriquet ‘Mr Texas’ — is a miracle of historical prose. But Caro uses the primary battle between the two men as a metaphor for the evolution of modern American politics. Stevenson had a reputation as a man of total integrity: he had never taken a dollar of lobbyist money. Stevenson was so old-fashioned he campaigned by turning up in small town squares and introducing himself to citizens; he didn’t even issue a policy platform, because he believed politicians should run only on their records. In contrast, Johnson poured more money into the race than had ever been seen in a Senatorial primary. He hired a helicopter and barnstormed around the state in it. Johnson also won the support of the Democratic machine in rotten boroughs in the state’s southern counties, which allowed him to capture crucial votes with what were almost certainly stuffed ballot boxes. When Stevenson challenged the result in court, Johnson won — again largely because he was able to manipulate the Democratic Party machine. What we see in Caro’s Means of Ascent is therefore a masterpiece of historical narrative. Caro is not merely chronicling a particularly interesting American state election in 1948. He is in fact developing what Daniel Little would call a social explanation of power — an explanation a good deal richer and “thicker” than the descriptions sometimes offered by sociologists and anthropologists when they turn to the nature of power in democratic societies. A final point is worth making about this remarkable project. If and when Caro eventually publishes the final book in the series — we can only hope that he lives to complete the series — he will have been working on it for nearly half a century. I think it’s fair to say that a project of such longevity and ambition could no longer be produced by a working academic (the conditions of the publishing industry suggest that it probably can’t happen in trade publishing again, either, though that is a different story). Five books in forty years? No historian would continue to hold employment with such a track record, even if a few papers were churned out to buttress the monographs, even if the books she eventually produced were as successful and feted as Caro’s have been. And yet, on any meaningful measure of what history and the social sciences purport to be about, the work of Caro is at the pinnacle. It is both deeply serious and widely popular (his book on Moses was a bestseller, for instance). Caro has provided the single most important source of scholarship, both primary and secondary, of Johnson and his political surroundings. Even a specialist historian who merely set out to be the acknowledged expert on a single president would struggle to match Caro’s impact, and yet a professional historian who published as little as Caro would soon find herself bundled out of the faculty. It’s a sobering realisation for any working academic that the conditions of academic working life are now such that the working academic can no longer realistically aspire to producing the kind of serious, important work that academia claims to be about. This blog is a long-time fan of the University of Glasgow’s Philip Schlesinger, so it was with great interest that we stumbled across his 2015 lecture to the London School of Economics on that most controversial of cultural ideas, the “creative industries”. But it is an excellent summary of the development of the idea and the current state of play. (No doubt critics of this kind of analysis like Terry Flew might beg to differ). Make sure you watch to the end, because you get a bonus discussion from Angela McRobbie. Well, it’s been quite some time, but I’ve decided to get the Cultural Policy Blog back up and running. Over the past couple of years I’ve been heavily occupied in a series of shorter- and longer-form projects, including a book and way too much time on Twitter. But it’s time to get the band back together. I was particularly inspired by the high quality of cultural policy scholarship still being published in the academic and popular journals, and by the continuing example of awesome bogs like Crooked Timber. So, here goes. I’m sure there aren’t too many regular readers left, but I’m hoping that with some diligence over coming months, I can again contribute to a vibrant international conversation about cultural policy. 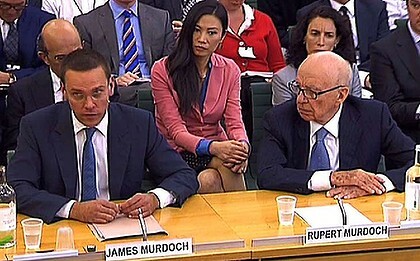 James, Wendy and Rupert Murdoch front the British Parliamentary Committee on Media, Culture and Sport, 2011. Image: Sydney Morning Herald. Over at the Sydney Review of Books, I’ve got a long-form review essay on two of the latest books out on Rupert Murdoch’s News Corporation and the British phone hacking scandal. I won’t re-post here, but rather direct you over to the site, which is publishing some very fine work at the moment. Lanchester wrote that Murdoch’s singular attribute is his flexibility: a ‘flakiness’ in which ‘the all-over-the-globe nature of the News Corp empire seems to be paralleled by a personal all-over-the-placeness in Murdoch.’ Like the ‘hot money’ of the international currency markets, his energies and attentions flow unpredictably and suddenly, to wherever the opportunity lies. He understands, in the end, perhaps only one lesson: that symbols are powerful, and that in a democracy, this power can be used. One of the things that Murdoch likes to do with his media power is, of course, to make money. But he also likes to acquire more power: for instance, by gaining the ear of prime ministers. You never know when you might need a regulator to sign off on your next deal. Respected South Australian academic and consultant Jo Caust has a new paper out in the International Journal of Cultural Policy. Entitled “Cultural wars in an Australian context: challenges in developing a national cultural policy,” it’s the first detailed academic examination of Australia’s tortuous journey towards a national cultural policy during the six years of the Rudd-Gillard Labor government of 2007-13. Regular readers of this blog and of my arts journalism will know what a rocky road that was. Labor originally promised a new cultural policy in opposition, under charismatic arts spokesman and later Arts minister, Peter Garrett. By the time that the eventual policy, Creative Australia, was finally announced, it was 2013. Garrett had come and gone as Arts minister, and Labor had also replaced Kevin Rudd as prime minister with Julia Gillard. Creative Australia ended up being the policy of the land for only seven months, with Labor losing the 2013 election. Caust’s paper covers this history, and analyses the development of Creative Australia and the legislative reforms to the Australia Council that passed the Australian Parliament in 2013. Perhaps her single most salient insight is the degree to which the Canadian model of arts funding has influenced the current reforms. For those who covered the issues on a daily basis for the last six years, there is much that rings true. Although there is nothing particularly new in what she observes, she has done everyone a service by putting it all together in one place. As a result, her paper is a fine summary of the troubled and turbulent political environment under which cultural policy was made during the last government. For international readers in particular, this is a useful ‘first draft of history’ with which to begin the discussion of Labor’s cultural policy legacy. (Disclosure: Caust cites my work frequently in the paper, so I may be biased). From the early part of this millennium there has been much public discussion about the framing and delivery of cultural policy and arts funding in Australia. When a Labor government was elected in 2007 this resulted in a conversation with a select group about the concept of a ‘Creative Australia’ followed by a series of government initiated reviews on aspects of arts and cultural delivery, culminating in the publication of a Creative Australia in March 2013. This document shifted the conversation about cultural policy to embrace a broader deﬁnition of culture as well as update, to a limited extent, current approaches to arts funding. At the same time another government initiated review recommended signiﬁcant changes to the national major arts funding body, the Australia Council. In this process, there was a shift towards more government inﬂuence over the workings of the Council while at the same time there was a recommendation for increased funding. However, a change in government 6 months later made the implementation of all of the recommendations unlikely. In fact in the new Coalition government there is already evidence that there may be signiﬁcant cuts in funding, and in this likelihood, the high arts would be given preference. In addition a broader embrace of cultural policy issues is unlikely under a Coalition government given their stated resistance to this paradigm. So in the short term any perceived shifts in understanding and valuing of arts and cultural issues in the Australian context, as an outcome of the latest approach to developing an Australian Cultural Policy, may have a limited tenure. Certainly the framing and content of national arts and cultural policies continue to be a political issue in Australia as they are elsewhere. Even so there is also a possibility that the present Coalition Government, while publicly rejecting the framework of Creative Australia, may still embrace aspects of it, if it should suit their political agenda.